Rental Rate: Call for Price. Speed, accuracy, and head-to-head competition make this high energy game a true winner. Hold a tournament and see who has the fastest hands in town with the most incredibly addicting games on the market. 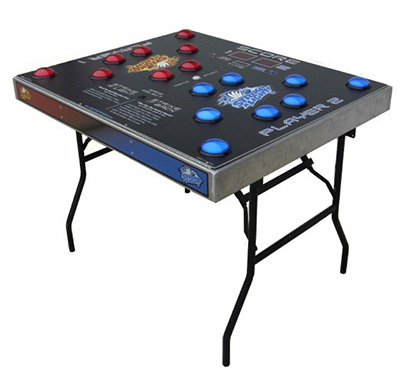 Available in both portable and arcade formats, this game is sure to draw a crowd at any event or venue. Be one of the first to hire this hi-tech, hi-energy challenge game. Heads up challenge an opponent to put out more lights than you in 1 minute or pass a light you pass all 5 of your lights to these side of the board before they pass there 5 to you! Looking for that perfect centerpiece to you next Corporate Event? Then look no further, Strike A Light is perfect for any occasion. A head-to-head reaction time contest is the perfect way to get a group going. A skill everyone possesses, and great for all ages, abilities, and sexes. Strike A Light is one of the only games that truly involves everyone from your company. Create a tournament and see who has the speed and accuracy to navigate your company through the future! Ask how you can have Strike A Light as part of your next event.